Lace Music™ announces the 2019 collection of Cigar Box Guitars featuring the patented Matchbook™ Pickup. 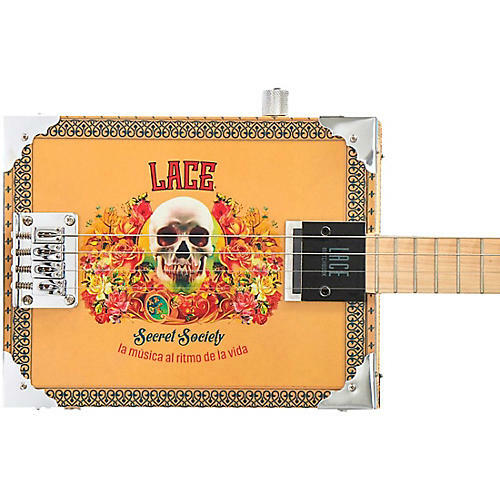 The new Lace Cigar Box Guitar has a fresh sound, designed for ease of play. It is capable of effectively delivering rock, alternative, country, blues or jazz music with a gripping tone and striking authenticity. This is the three-string model with the Secret Society design. Lace™ Cigar Box Guitars maintain Lace's hand-built approach to guitar building. Both the box and neck are made with high-quality materials, including a double truss hard-rock maple neck for stability. The bridge features a steel plate design offering 20mm of adjustability for perfect intonation of each string. The tuners are open-gear type, reminiscent of classic vintage instruments and sport a 14:1 gear ratio.